Pesto can be made from many herb choices. I have a small herb garden of basil, chives, parsley, thyme, sage and rosemary, but not enough to make pesto. 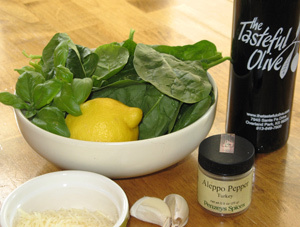 I always have spinach on hand and when I make pesto I start with a spinach base and add whatever herbs I want to enhance the flavor. This time I’ve added some basil leaves. 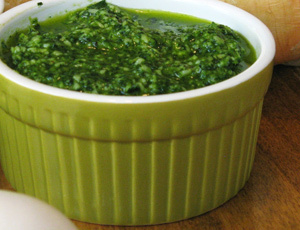 Pesto adds flavor to pizza, soup, sandwiches or pasta. I use pesto in many recipes so I thought it deserved it’s own post. I started with spinach leaves, fresh basil, minced garlic, parmesan cheese, olive oil and a little aleppo chile flakes for spice. Pack the spinach leaves in a food processor and pulse, add basil, lemon zest, spritz of lemon juice, parmesan cheese and red chile flakes. Generously drizzle olive oil over the mixture. Continue blending mixture and adding olive oil until you get a nice consistency. Add a sprinkle of salt and pepper to taste. Pack all ingredients except olive oil into a food processor. Generously drizzle with olive oil and pulse until mixture becomes coarse. Continue adding olive oil while processing until you get a desired consistency of pesto. Salt and Pepper to taste. 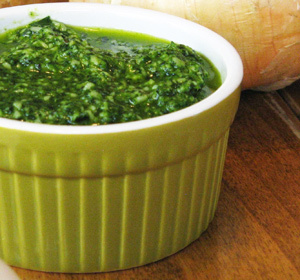 Note: You may add Pine Nuts, Walnuts, or Pumpkin Seeds to any pesto if you like a nutty pesto.